The findings could fuel debate about the barrier between life and death, and provide a new way of researching diseases like Alzheimer&apos;s.
The researchers found working synapses - the connections between brain cells that allow them to communicate. Prof Nenad Sestan, a professor of neuroscience at Yale University, said: "Cell death in the brain occurs across a longer time window that we previously thought. "What we are showing is the process of cell death is a gradual, stepwise process. "And that some of those processes can be either postponed, preserved or even reversed." Ethicists, writing in Nature, say new guidelines are needed for this field because animals used for research could end up in a "grey area - not alive, but not completely dead". The immediate benefit of this work will be for scientists studying the brain in diseases like Alzheimer&apos;s.
Dr Andrea Beckel-Mitchener, from the Brain Initiative at the US National Institute of Mental Health, said: "This line of research could lead to a whole new way of studying the post-mortem brain. "It also could stimulate research to develop interventions that promote brain recovery after loss of brain blood flow." Prof Sestan said: "We don&apos;t yet have knowledge whether we would be able to restore normal brain function." At the moment no, but some ethicists say we should have the debate now as people who are "brain dead" are a major source of organs for transplant. Prof Dominic Wilkinson, a professor of medical ethics and a consultant neonatologist in Oxford, said: "Once someone has been diagnosed as &apos;brain dead&apos; there is currently no way for that person to ever recover. "The human person that they were has gone forever. "If, in the future, it were possible to restore the function of the brain after death, to bring back someone&apos;s mind and personality, that would, of course, have important implications for our definitions of death." Prof Tara Spires-Jones, deputy director of the Centre for Discovery Brain Sciences at the University of Edinburgh, said: "This study is a long way from preserving human brain function after death as portrayed in the cartoon Futurama where heads were kept alive in a jar. "It is instead a temporary preservation of some of the more basic cell functions in the pig brain, not the preservation of thought and personality." 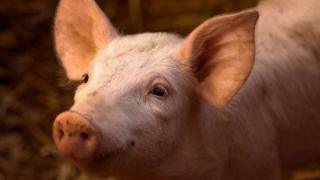 Could the pigs&apos; brains be aware? Also, the team used drugs to suppress brain activity - would the decapitated brains have been aware if they hadn&apos;t? Published on Wed, 17 Apr 2019 17:00:27 GMT, © All rights reserved by the publisher.